Tip: You can use Cellucor C4 Ripped to assist you with burning fat while also getting the energy needed for your workout without adding creatine. Fat loss is just as important to your bodybuilding routine as muscle gain. Cellucor C4 Ripped is a pre-workout supplement that supports added energy for a workout combined with a fat-burning formula. The two functions provide you with the energy needed for training plus the power to burn fat effectively and quickly. You should notice how the product works for your body, what with it being a suitable formula that promotes better workouts. The most intriguing point though is that the product does not contain creatine, thus producing a more interesting development for your body. One of the more intriguing points about C4 Ripped is that this is a pre-workout formula that does not include creatine. Rather, it focuses on a formula known as the Ripped Blend. The 1g blend features green coffee bean extract to support fat loss. Chlorogenic acid is a key part of what makes the extract work; the compound reduces how carbohydrates are absorbed in the body, thus reducing the risk of blood sugar spikes. L-carnitine tartrate is included for added focus. Capsimax cayenne fruit extract to trigger the body’s metabolic processes. The process is needed to start the fat-burning effort. The inclusion of Coleus forskohlii is an interesting part of the Ripped Blend. The Ayurvedic medicine product burns fat by increasing the cellular levels of cAMP, a molecule that assists in how the body can naturally burn fat. A 371mg Explosive Energy Blend is also included with 150mg caffeine anhydrous for added focus. The velvet bean seed extract is one inclusion in the blend that stands out for how it includes a precursor to dopamine. The added support elevates the mood, thus improving upon how well the body feels during a workout routine. Everything is rounded out with 1.6g beta-alanine for added performance and 1g arginine to assist in the production of nitric oxide. The two combine to reduce muscle fatigue in a workout and to strengthen how well the body can handle its weightlifting functions the right way. 250mg vitamin C serves as a powerful antioxidant to clear out old free radicals. 30mg niacin restores the body’s fluids during a workout. 250mcg folic acid is needed for preventing pains during the workout. 500mcg vitamin B6 supports the production of hemoglobin, a protein that carries oxygen throughout the body. 35mcg vitamin B12 assists in the formation of healthy red blood cells. You will need those cells to keep your workout efforts under control. 28mg calcium is included for promoting bone health, thus assisting in supporting the stronger muscle fibers you can develop in your workout. This is also to assist in keeping your body stable during your workouts. 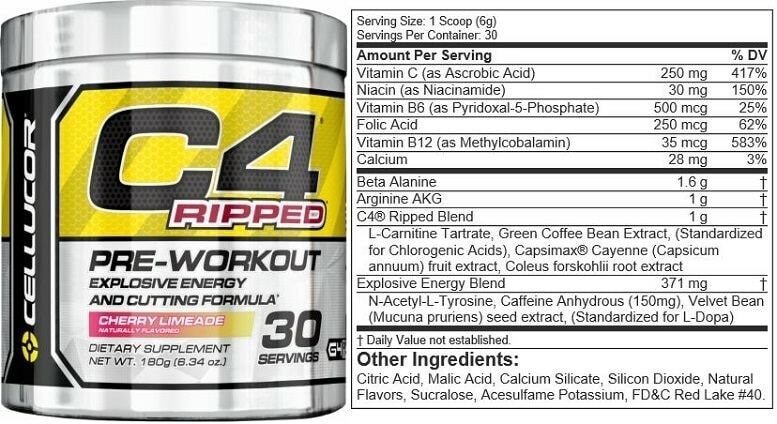 Cellucor C4 Ripped includes some extra ingredients like citric acid, malic acid, sucralose, and natural flavors. Red Lake #40 is used as a coloring, although that is the only coloring in this product. Prepare a serving by taking one scoop of the formula and adding it to 12 to 16 ounces of water. Consume about 25 to 40 minutes before your workout. You can use half a serving at the start to test how well your body can respond to the formula. The flavor is not overly sweet or sour, but it is easy for the body to process. The Fruit Punch flavor has a cherry tone to it. Cherry Limeade, Ultra Frost, Fruity Rainbow, and Raspberry Lemonade flavors are also available. 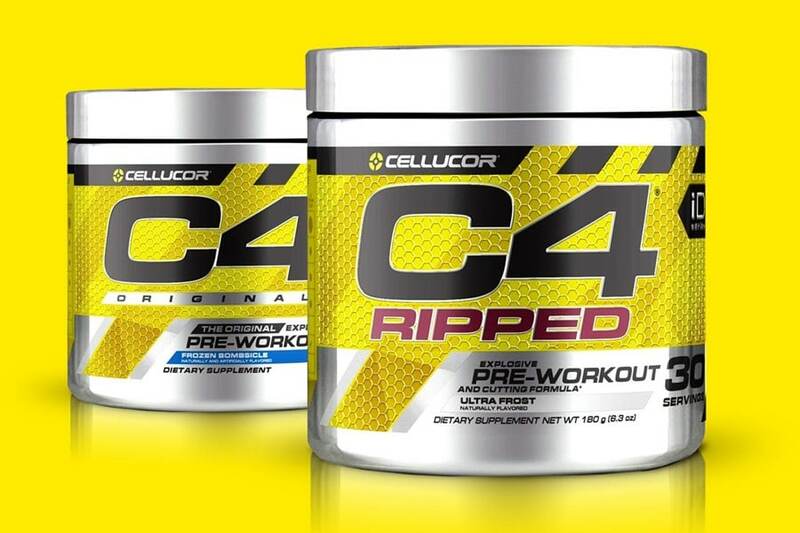 The Cellucor C4 Ripped product is available for $27.89 in a 30-serving container. At about 93 cents per serving, the product is an impressive deal that is surprisingly affordable. You can notice how well Cellucor C4 Ripped works by comparing this with other popular pre-workout supplements. Naked Energy All Natural Pre Workout Powder is one such example to note. The vegan-friendly formula does not include creatine, but it does focus mainly on a mix of healthy vitamins and minerals. Vitamins C, B3, and B6 are added alongside 2g beta-alanine for your health. There are no added sweeteners or flavors, thus making this product worthy of the brand’s name. Genius Pre Workout Powder is a second choice to compare C4 Ripped with. Genius concentrates on boosting nitric oxide levels in the body. Alpha GPC is added to enhance muscular output while controlling how mental fatigue may develop during a workout effort. Natural sweeteners are also included to keep the body from experiencing any substantial blood sugar spikes while using the product. A third choice to note is Muscle Pharm Combat Pre-Workout. The product focuses on offering 400mg tyrosine for boosting your body’s endurance levels. 100mg theanine is also incorporated to help reduce blood pressure levels, thus allowing blood to flow properly. The main point about these products is that they do not contain any creatine. It goes to show that creatine is not necessarily a factor that is needed for when you’re aiming to grow muscle mass. The simple creatine-free design of Cellucor C4 Ripped focuses more on giving you the energy needed to get your workout running. The product assists you with burning fat quite well and is easy to tolerate in many situations. But while this is a suitable pre-workout product that is appropriate for many intentions, you should look at how well you can tolerate the product. Try this out to see what makes the formula so valuable for your workout needs. The simple creatine-free design of Cellucor C4 Ripped focuses more on giving you the energy needed to get your workout running. The product assists you with burning fat quite well and is easy to tolerate in many situations. Thank you for this fair review on Cellucor C4 and for showing its pros and cons. New to the muscle building business and I may give this product some consideration.